If you are interested in this review, you may also like to listen to a podcast of Richard and Daniel Susskind’s lecture at LSE, held on 30 November 2015. The Future of the Professions: How Technology Will Transform the Work of Human Experts. Richard Susskind and Daniel Susskind. Oxford University Press. 2015. We’ve grown accustomed to the decaying hulls of factories and abandoned shopping centres. We’ve begun to see the hollowing out of suburban office parks and we can even envision being transported by fleets of robot taxis. Yet we are working, studying and legislating as though our schools, courts and hospitals will continue as hubs of economic activity abuzz with an app-enabled but largely unchanged cadre of educators, lawyers and doctors. Richard Susskind and Daniel Susskind provide a descriptive, predictive and normative account of why our professional institutions will not, and should not, endure. 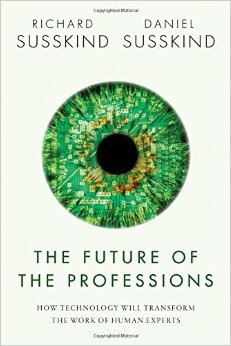 The Future of the Professions: How Technology Will Transform the Work of Human Experts deserves to be widely read because society, and professionals in particular, are operating with limited vision and flawed assumptions about the future of professional work. Richard Susskind’s extensive career advising business and government at the highest levels, including as IT adviser to the Lord Chief Justice of England and Wales, has focused on the future of the legal profession (see The Future of Law: Facing the Challenges of Information Technology, The End of Lawyers? Rethinking the Nature of Legal Services and Tomorrow’s Lawyers: An Introduction to Your Future). His own background is in law, a field in which he holds professorships at University College London and at the University of Strathclyde. His legal background and previous works inform the coverage of law in Chapter Two, which examines the cutting-edge of current practice and predicts future directions. For the legal profession, the authors describe recent innovations in practice like online dispute resolution, virtual courts and the automated preparation of legal documents. They predict that deregulation, disaggregation of legal tasks and the embedding of legal compliance within systems and structures will further transform today’s costly and inscrutable legal system. They describe disruptive innovation in education and health, two professions that have attracted a great deal of speculation already (see, for instance, Eric Topol, The Patient Will See You Now: The Future of Medicine is in your Hands; Kevin Carey, The End of College: Creating the Future of Learning and the University of Everywhere; and Will Richardson, Why School? : How Education Must Change When Learning and Information are Everywhere). More surprisingly, they describe radical technical change in the work of the clergy, tax advisers, management consultants and architects. In each case they find that technology will make expertise much more accessible to consumers and leave a small role for human experts. Of the major professions, only engineering was not included. Not everyone is convinced. In Chapter Six the authors counter several anxieties and objections to their future vision of the professions, applying the logic of cost-benefit analysis. They emphasise how lowering the cost of expert advice will extend its benefits throughout society. They then use the benefits of increased access to refute a series of counterarguments in turn – what about the loss of craft? The preference for human interaction? The need for empathy? It is an effectively constructed argument, as the benefits of wider access probably do outweigh any single one of these costs. Yet the real question is whether the benefits outweigh the loss of the professions to creative destruction. This book explicitly does not address ‘privacy, confidentiality, security, and liability’ or ‘the dark side of the Internet’. While it may have been impossible to address these topics thoroughly within the scope of this already ambitious book, I think the authors went too far in setting them completely aside. With a new data breach in the news every week and the increasing engagement of state actors, it is clear that our IT infrastructure operates in a hostile environment. For example, if a nation’s medical diagnostic expertise is concentrated in an expert system rather than dispersed among human experts, it is vulnerable to system outages and covert manipulation. The risks aren’t limited to cybersecurity. The authors envision a model where most professional advice is available free to users. Yet free information is not a bar to profiteering. As the saying goes, ‘if you are not paying for the product, you are the product’. When the authors suggest that the problem of empathy in delivering bad news could be countered through an algorithm using consumers’ ‘psychological and emotional profiles’, they seem untroubled by the prospect of such profiles taking their place alongside credit reports and criminal background checks in the business environment. Given Richard Susskind’s legal background, it’s surprising that liability, and accountability more generally, are set aside. One area where the professions have arguably been successful is as a pathway to good work: work that is stable, well-compensated, intellectually engaging and often motivated by values beyond the market. The authors unambiguously predict ‘a decline in demand for the traditional professions and the conventional professional worker’. However, they do foresee a variety of new and emerging roles with the potential to provide good work: para-professionals, craftspeople, process analysts, system engineers and even specialist ‘empathizers’. These proposed future roles are another place where neglecting security issues leaves the book incomplete. There might well be future roles for white-hat hackers, personal data guardians, privacy officers and other security workers. In a book that is accessible to a broad audience yet theoretically grounded, the authors approach professions as the result of a grand bargain to address specific properties of specialist knowledge. They find this grand bargain with the professions now failing ‘economically, technologically, psychologically, morally, qualitatively, and in terms of their inscrutability’. Technology offers alternatives that will displace much of the current professional workforce. Susskind and Susskind argue that we can, will and in fact do face a moral obligation to transform our institutions for access to expert knowledge. Jennifer Miller is an Assistant Professor (Teaching) at the University of Southern California’s Sol Price School of Public Policy. She received her doctorate in public policy from the University of North Carolina at Chapel Hill. Her research interests focus on the intersection between science and technology policy and the future of work. She has also written about collaboration among universities, industry and government in university research centres. Before pursuing her doctorate, she worked for IBM in human resources. Read more reviews by Jennifer Miller.